Hill 809 is a mountain top edging the A Shau Valley. In April 1971 a Ranger radio relay team used 809 as a secondary LZ, but it had not been prepped as was the custom in my experience. When the Rangers landed they were taken under fire from the hill top by dug in NVA. There were several casualties, both dead and wounded. To their rescue came elements of the 2/17th CAV, which lost one helicopter that rolled on its side in the LZ with all crew members on board. Then came the Medavc, with Fred Berhens as the pilot. He managed to get some wounded aboard and tried to take off in a hover but the craft was hit badly and was making a hard landing when Fred was wounded. There is a lot more to Fred's personal story of the night he spent there as well as very near misses from our "Snakes", shooting up the LZ. The next day, we, Bravo 2/502, got into the fracas - attacking in the morning and eventually taking the hill. A Ranger Team (six or seven men) and a platoon from C2/502 were attached to us. For some reason, after all was secure, I went over to an airman who was one of the rescued and said something to the effect of, you're OK now, we'll have you back in the rear soon, you're safe. 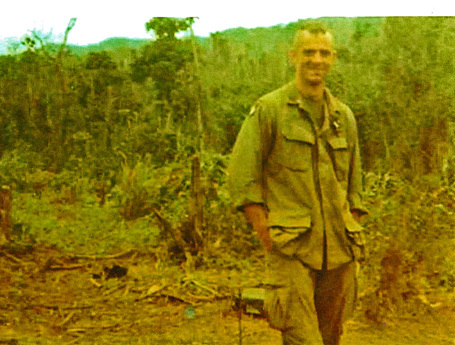 During the winter of 08, I received a phone call, the caller asked for me by name and said that he had served with me in Vietnam, Bravo company. I didn't recognize the name, John "Runner" Hartel. We reminisced about some our experiences and what we were doing with our lives. 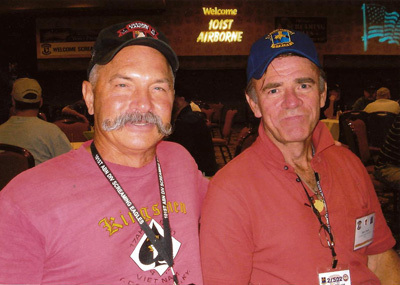 He called again several times urging me to attended the 101st's reunion in Reno. He had attended the reunion in Atlanta and had a great time and met several of the "guys" from our unit. I'm not a member of any VET organizations, no parades, no reunions, one might say when it comes to my war experiences I'm somewhat of a recluse. "Runner" convinced me that time was getting short and I should take advantage of this opportunity, so plans were made. My wife and I made it to Reno and stayed at a hotel across town. She went to the pool and I walked to the hotel where the reunion was being held. It was a long hot walk, not one of my best decisions. As I entered the building surrounded with slots, I could see several reunion guys standing around, unmistakable with their reunion hats on. I approached them and asked where do I go to sign in. Graciously they said that they would take me to the sign-in area. We walked, two abreast, but the guy next to me with a very large handlebar mustache took no notice of me. So I asked him who he had served with, and he replied: "I not a member of the 101st. I got shot down in April of 71 in the A Shau, and the 101st came in and got me out". Chills ran down my spine, goose pumps covered me. Was that hill 809! He said he didn't remember the hill number. My reply was, that was us on that mission. We made it to a table and gazed at each other. I couldn't have recognized him if I wanted to as that crew member's face was covered in blood and dirt when I had approached him so many years ago, offering some reassurance as he sat on a stretcher waiting for his turn off the hill. We exchanged our stories of the event, while others at our table listened. The pilot is well known at these reunions having attended so many, he is well like and admired, everyone knows his name and it seems that he know theirs. After awhile people would walk by our table and with no words said nod to both of us with acknowledgement and approval in their eyes, the story having been passed on and heard by others. Hartel never made it to Reno, but I saw him in Indianapolis and Nashville.